$14.92 = silver price / ounce on Apr 25, 2019. $2.9124 = copper price / pound on Apr 25, 2019. The CME uses pounds to price copper and that means we need to multiply the metal price by .00220462262 to make the conversion to grams. The silver price is based in troy ounces and that means we need to multiply the metal price by .0321507466 to make the conversion to grams. 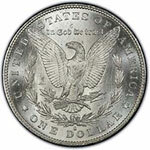 $11.5398 is the rounded silver value for the 1878-1921 silver Morgan dollar on April 25, 2019. This is usually the value used by coin dealers when selling these coins at melt value. However, the total melt value is continued below. $11.5570426374 is the total melt value for the 1878-1921 silver Morgan dollar on April 25, 2019. ← Calculate coin worth using your own quantity and silver price values. The "Year" column lists the year and mint mark on the coin -- D is for Denver, S is for San Francisco, O is for New Orleans, CC is for Carson City, and P is for Philadelphia. A coin without a mint mark means it was also minted in Philadelphia (which is the case for the Morgan dollar). The "Mintage" column is the number of coins struck and released by the U.S. Mint. The "Numismatic Value Range" column represents what people typically pay for that type of coin (usually a very wide price range depending on the condition). The PCGS price guide on Morgan dollars has an updated list of certified coin prices. If you're interested in survival and rarity estimates (including the latest realized auction prices), also consider visiting PCGSCoinFacts.com. 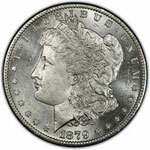 For example, they estimate there are only 25,250 known examples of the 1889-CC Morgan Dollar. This includes raw coins, those certified by PCGS, and those certified by other grading services. If you're interested in learning more about grading silver dollars, Photograde is an excellent resource. I believe that the old saying, "A coin is only worth what someone will pay for it," is absolutely true. I prefer eBay because it displays what people are actually paying for coins. Monthly coin price magazines and online price lists may not reflect current market conditions because they don't demonstrate what people are actually willing to pay. This material may not be redistributed. All rights reserved. All content on Coinflation.com is for informational purposes only.